I have a camelback that part of the water pouch is cool-gel stuff. Just refrigerate and it keeps both you and your water cool. May have to figure out how to incorporate it into my costume. Just had my first troop with the Camelback installed. It was sweet being able to drink while hidden in costume, it made a huge difference in regards to staying hydrated. I was able to stay in costume almost an hour longer than normal. Finally got myself a Bowcaster. Bought if from Diamond State Props, weathered it and added a shoulder strap. All in all, I am very happy with it, especially as it only cost me $200. It does have some inaccuracies, but 95% of the people out there will not be able to tell the difference. They will just see Chewbacca with his Bowcaster. I read that you finally got your bowcaster , how long did it take to get it deliver to you ? How's the weight on it? Its only 3.4 pounds. So it has some weight to it but can easily be carried. So I made another modification to my Chewie. A while back I installed a Camelbak on the back of my shoulder pads so as to be able to drink while in costume and stay hydrated. It worked great expect for it gave Chewie a hump. I hated the hump back look but loved being able to drink while in costume. So what to do? One day I looked down and realized my pouch is empty. Could I put the water in there? So I removed the Camelbak from the shoulder pads and put the water in the pouch. Then ran a tube up the rear of the belt to the waist where it meets a tube attached to the rear of the shoulder pads, going over the shoulder and to the mouth. Inside the helmet I place a clip to hold it in place. I tested it out at an event this past weekend and it worked perfectly. I was able to drink while in costume and no one had any idea. The only thing one could see was a tiny bit of clear tube coming out of the rear of the pouch. As it is in the rear, where no one is looking it is basically unseen. I made a few changes to the mask interior. I had too much lining in it so I removed all the lining except for around the eyes so it breathes better. Added some extra padding on the forehead. I also installed two fans, one at the bottom near the jaw and one up top. Both will help with air flow. In order to fit the fan up top I tucked the battery pack inside the top padding. As I was working on the fans I noticed the hair on the face was getting thin in places. 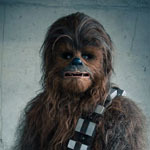 I have had Chewie for almost 2 years to I decided it was time to give him a facial and touch him up a bit. From a distance he looks fine, but up close one can see the wear / tear / thinning, especially the moustache and lower lip. Two years of wear has thinned the hair out a fair bit. Initially the hair was glued onto the face. I decided I would fill in these areas with some hair punching. The mustache with the hair half done. You can see how bad the lower lip is looking. Lots of hair loss. The mustache and lower lip are all done. It now looks a lot more full. With the lower mouth done I noticed the upper part of the head was looking thin. I cut a piece of hair to lay over top of the upper eye, glued it on, then punched in hair around the rest of the eye to fill it in. Also added hair right above the nose in-between the eyes. Glued on some additional patches of hair to the forehead as well as the ear to add some additional fullness. The sides on the nose needed some filling in as well. After several days of hair punching, the end result looks great, nice and full! Thank you kindly for posting and sharing your mask maintenance, improvements, and modifications - it is greatly appreciated. Definitely like the idea of the fans inside the under skull of the mask- that will be a blessing during troops! Does your face or forehead touch the fan casing? This thread looks so useful, but none of the photos work anymore !